With the continued expanse of MMA and BJJ, no Gi is becoming more and more popular. 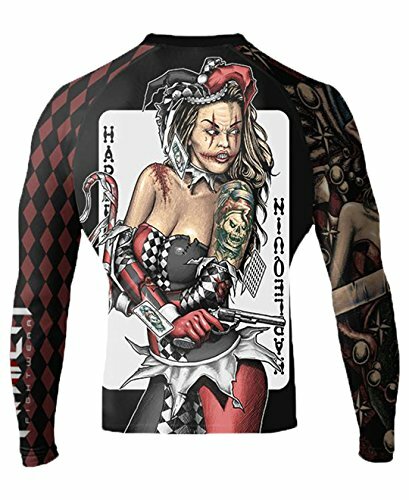 This has given rise to an increased demand for good quality rash guards. Rash guards are a vital part of any MMA fighters training gear and can now also be used in combat. Rash guards provide the ultimate protection from mat burn and other skin abrasions picked up from MMA mats. If you don’t want to go home every night with scars from the mats, then you need a rash guard. A good rash guard will keep you at your prime and is a must for BJJ, grappling and wrestling. A rash guard aims to keep skin healthy on chest, arms and back whilst allowing full movement and breathability. We all want cool Bjj rash guards but what is also important is that it should to do what it’s made for. Its fine having the coolest rash guard in the gym but if it’s not protecting you or rips after two weeks then it not worth the good money you spent on it. What you need from a good rash guard is a guard that has perfect coverage, washes well, and lasts a long time. It would also be best to choose a guard made from strong material which helps the skin to breath. Once all the above essential criteria are weighed up then choose your cool design. Its important to not only look cool but be fully protected and what’s cooler than that? The best rash guards should feel like a second skin and keep your body dry and comfortable, also provide a precise fit for complete unrestricted movement. A good guard will draw moisture away from the skin to keep the body dry and at optimal temperature. Augmenting the body’s temperature is important as it keeps skin dry and muscles warm, which can enhance performance. Also check whether they are compliant with the International Brazilian Jiu-Jitsu Federation (IBJJF) rules if using for competition. Now you know what to look for in a good rash guard its time to choose your cool design. We have found some of the coolest designs come from brands such as Tatami, Raven, Venum and Primal gear. Take a look at these smashers for starters and if these don’t get your boat rocking then please check out our store for even more cool bjj rash guards. Get the power of the rising dragon! Fly towards your goals and never stop improving. Gain the confidence and the power to achieve your dreams wearing this Dragon’s Flight Rashguards, true symbol of strength and determination. It’s your time to rise!